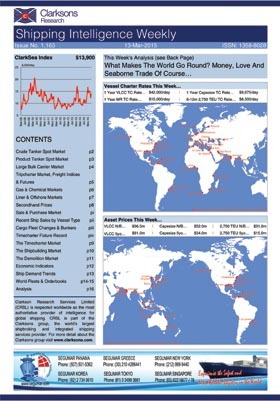 Shipping Intelligence Weekly is the only report covering developments across all the shipping markets. Using information from Clarksons' staff of over 1,379 worldwide it fits into just 20 pages more than 500 statistical series and 22 graphs. It monitors freight rates and/or daily earnings on 41 Tanker and 43 Dry Cargo routes, and the freight markets for Gas, Chemicals, Container, MPP, Short Sea and Offshore vessels. Rated the No.1 shipping report by independent market research. The quickest way to keep in touch with the fast-moving shipping markets. Other values include time charter rates and newbuilding, second-hand and scrap prices. A unique report on the world cargo fleet and orderbook, plus contracting, delivery, scrapping and sale and purchase activity, keep tabs on tonnage supply. Ship demand indicators include latest global economic and financial data and monthly trends for oil and dry bulk commodities. 'At a glance', easy to read text for each segment eases the reader through the report, while a 550 word back page feature article provides enlightening analysis on issues in the shipping business. Shipping Intelligence Weekly is circulated “hot off the press” every Friday (by post and e-mail) ensuring you receive the most up to date information. It is designed for busy decision makers who must have all the facts at their fingertips with the minimum of effort.